Community—something we at Stone’s Steakhouse share a great passion for. The people, history, and culture of Central New York influence all we do at Stone’s Steakhouse. Owner April Stone and her brother, Mike Favaloro, co-own Green Acres—a farm located in Marathon, NY—where cattle are raised in a humane and natural environment. This results in high-quality and full-flavored beef, and guests can taste the difference. We bring products straight from our farm to your table, and that’s something you won’t find everywhere. We’re providing Syracuse with the best from our own Green Acres Farm in every meal. We’re committed to giving guests exceptional food, and we believe that comes from sourcing products grown and raised right here, in Central New York. Our mouthwatering menu is filled with locally sourced products. Every filet mignon, sirloin, and short rib comes from our Green Acres, Black Angus Beef Farm. Creative dishes with unique flavors are made every day and can only come from the Stone’s Kitchen. Every slab of beef, breast of chicken, and fresh-picked green is treated with care and brought to its fullest potential by our kitchen staff. Stone’s Steakhouse believes in giving guests the best, and we’ve found it right here in our own backyard. Our commitment to fresh, local, and delicious cuisine has distinguished us among other steakhouses, and we only plan on getting better. Providing a one-of-a-kind dining experience for every guest is our goal. We’re a New York City steakhouse in Syracuse, NY; we’ve taken this traditional idea and elevated it to a whole new level, bringing our farm to your table. We only use the best cuts of beef, and with locally sourced products, live music, and an exquisite menu, Stone’s steakhouse offers a dining experience like no other. Take a look at this episode of Painting the Town with Eric Dowdle, where Stone’s Steakhouse was featured! Our dedication to buying local and bringing food from our farm to your table brought Eric Dowdle to Syracuse, and April couldn’t have been more pleased to share her inspiring story. The atmosphere and service at Stone’s have impressed guests and critics alike, but what truly sets Stone’s Steakhouse apart is our cuisine. Head Chef, Brian L. Dewey has brought the Stone’s kitchen to life with an inspired menu that highlights the best local foods Central New York has to offer. Along with our standard menu, Chef Brian prides himself on creating weekly specialty dishes from fresh, seasonal produce and juicy cuts of meat. Brian leads our kitchen with efficiency and grace, resulting in dishes that are unparalleled in taste, quality, and creativity. 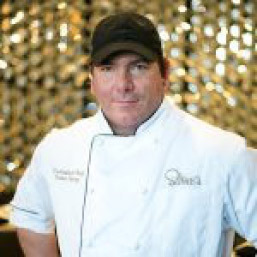 Chef Dewey’s years of experience behind the grill and passion for food has resulted in a menu that draws in guests and keeps them coming back for more. Contact us to learn more about our fresh Black Angus Beef, and other locally-sourced menu items, and book your reservation today!